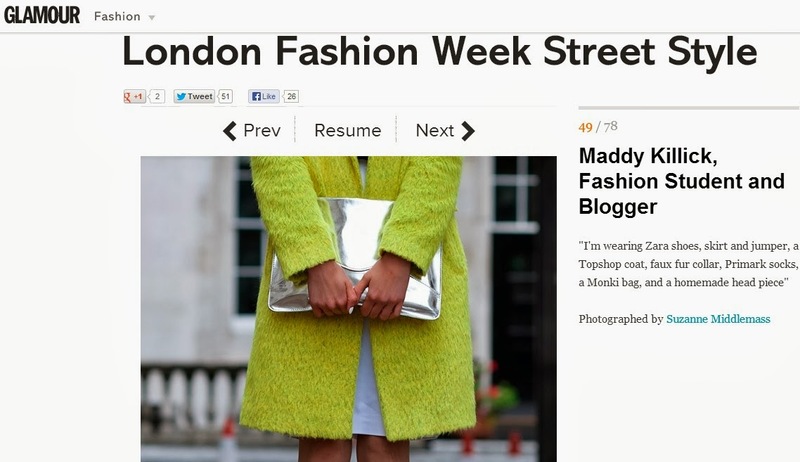 Fashion Obscura: LFW Update, Glamour Magazine and Exclusive interview with BuyMyFashion! 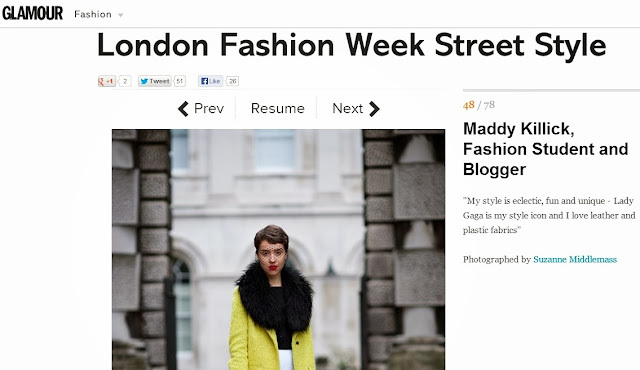 LFW Update, Glamour Magazine and Exclusive interview with BuyMyFashion! I had a blast at London Fashion Week and it seems as if the party still hasn't ended just yet as my outfit, and of course that acid yellow coat, have featured in many blogs and websites! If you want to get a first hand glimpse of my day at Somerset House check out these links! I've also been fortunate enough to gain the title as BuyMyWardrobe's "Blogger of the Week" which I am very excited about! This is my first formal interview but I thoroughly enjoyed babbling on about my love of Chanel handbags, Alexander McQueen and most importantly my blog! If you want to read more about my crazy, fashion filled life and blog I'd recommend checking out the link http://www.styl.sh/articles/227-blogger-of-the-week-madeleine-killick-of-fashion-obscura! Also check out the amazing second hand designer garments and leather goods available from BuyMyWardrobe- I can assure you that you will not be disappointed! Hope you have enjoyed all of the links as much as I loved London Fashion Week!